The free gas market is the only solution to get a fair gas price, eliminate abuses and the undeserved enrichment of some. But to reach a free market and especially to ensure its functioning it isn’t enough to define it, to say it or to want it. Market, as anything in this world, is built. It requires specific knowledge at the level of its participants, requires institutions to protect, correct and punish the improper behavior of players, requires rules to anticipate some speculative moves of players, requires a lot of rigor, determination and professionalism. The gas market in Romania has emerged as an illusion, in fact as several illusions, which have developed in several directions, many antagonistic, today tending to suffocate its players (consumers, suppliers, authorities, institutions etc.). After 18 years from the initiation of the gas market liberalization, when we should have celebrated the maturity reached in this market, the idea of interventionism, arbitrary and administrative measures, i.e. of abolition of the free market is looming more and more. If these manifestations take place at increases in gas prices as commodity by 10-15%, what will happen when the price of gas as commodity doubles? A question emerges: between the illusion of a free gas market and a real administrative market what is the difference? The answer for consumer is: none! The difference is only for the other participants, as the profit would move from some to others. The weighted average price of natural gas formed over the last 7 quarters on the exchange had a relatively high degree of predictability. 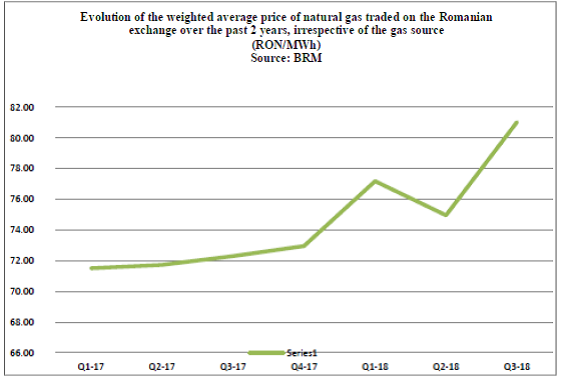 There was a manipulating trend last autumn, which brought slight changes in gas prices in the Romanian gas market and the trend this spring that brought big differences between a forecasted trend and the weighted average price established on the exchange. Wholesale market. Analyzing the transactions carried out during January 2018 – September 2018, on platforms made available by the Romanian Commodities Exchange (BRM), we determined the average price weighted with the gas quantities purchased with delivery in the respective month, taking into account all types of gas traded. 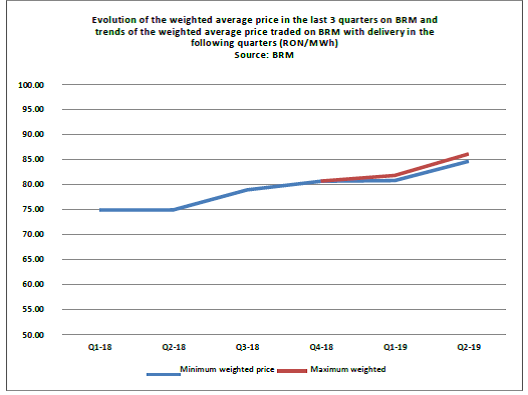 It can be noticed that starting with Q2 2018 there is an inflection of the trend of the weighted average price curve, which increased in Q3 2018 by 10.7% compared to Q3 2017 for gas traded, expecting an increase to 20.8% of the price in Q4/2018, vs. Q4/2017. 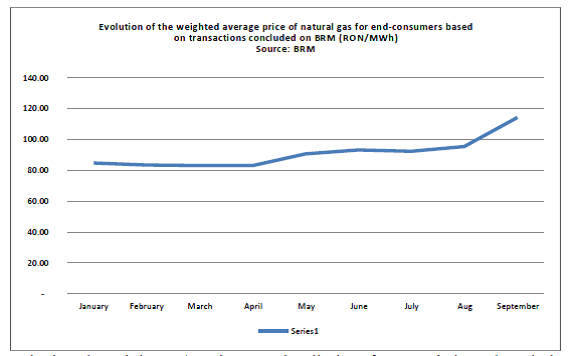 Analyzing the minimum/maximum price limits of gas traded on the wholesale market through BRM’s trading platforms delivered in 2017 and those to be delivered until December 2018, we estimated an upward trend of the price of gas from current production, above the trend of 2017 by around 9.9% for gas from current production; by around 14.8% for imported gas and around 10.4% for gas from the storage facilities. Retail market. While transactions concluded through the exchange on the retail market fell greatly over the last quarters, more recently the transactions on the wholesale market have also dropped significantly. To be able to compare the prices of gas traded, as commodity, we determined for each consumer who performed transactions the related regulated tariffs and thus deducted the price of gas as commodity, prices valid from the trading month for one year. Average prices of transactions performed on the retail market during October 2017 – June 2018 were in continuous growth, exceeding the threshold of 30%. Household market. 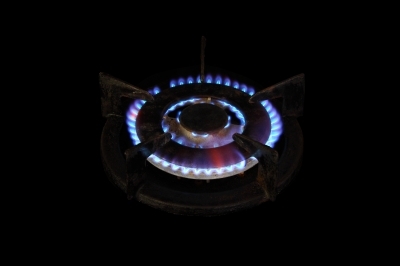 Gas price trends, for both gas from domestic production, and imported gas in particular, especially for imported gas to be necessary in the cold season, as well as the need to use gas from the underground storage facilities will lead to a potential increase in the price of gas for population in the cold season by around 10-15%, if we consider exclusively prices from transactions concluded through BRM. Analyzing the global trends of gas prices, we can see an upward trend of gas prices. 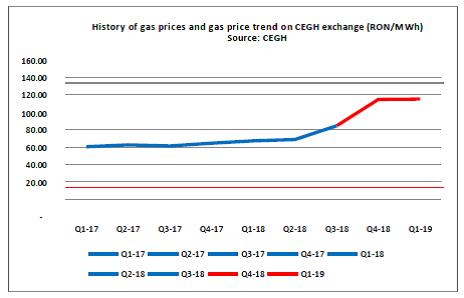 CEGH Vienna Exchange, the European gas exchange the closest to Romania, recorded a slight increase in gas prices in Q4-18 compared to Q4-17 according to futures contracts, by around 37%. The experience of the past years allows the use of this price as a benchmark for the price of gas from the Russian Federation sold in Central and Eastern Europe. 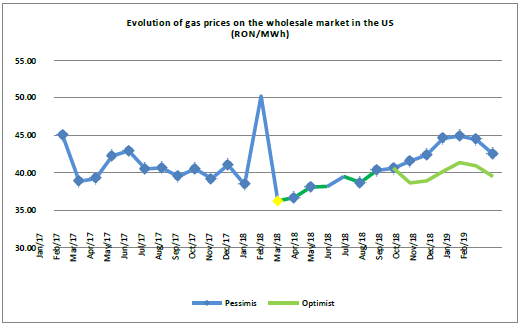 Analyzing the price trend of natural gas in the US in futures prices Q4-18 vs. the average price established in Q4-17, we can notice a trend of significant growth of gas prices, which according to some analyzes will be 8-16%. The next three months will bring a regime with thermal values within the limits of monthly climatological averages. (Source: NMA).